Born June 19, 1938 in Leningrad in the family of a military engineer. After 1945, the family lives in Moscow near Mayakovka. He graduated from the Moscow Institute of Transport and Engineering for several years worked as a computer center. Since 1965, many years of cooperation with the magazine “Smena” begins. First, an artist, then an art editor. In the Change are regularly published cartoons of many artists of the “new wave” – ​​Tyunin, Tishkov, Nekrasov, Vorobyov and others. 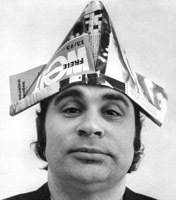 Then Tesler was the main artist of the Olympics-80, the magazines “Soviet Screen”, “Pioneer”, the newspaper “Izvestia”. Member of the Union of Artists of the USSR since 1988. Oleg Tesler’s creative heritage is huge – tens of thousands of cartoons and illustrations, dozens of concept models of magazines and newspapers, publications in the media in the country and abroad, numerous international prizes. Oleg left us in December 1995.